In this blog, we insist on the importance of creating quality content. Even if it takes time, especially when you start a blog, it’s not wasted work at all. But if you still have the perception it costs you too much to create quality content, I recommend you read Toni’s advice on how to write great content. If you write content that adds value, your visitors will become regular readers of your blog and you will get better positioning in search engines. But not only that, one of the great advantages of generating quality content on your website is that you already have all the material that will allow you to promote yourself on social media quickly and efficiently without being spammy. So here are the steps you should take to keep this issue from becoming a stone on your path to success. 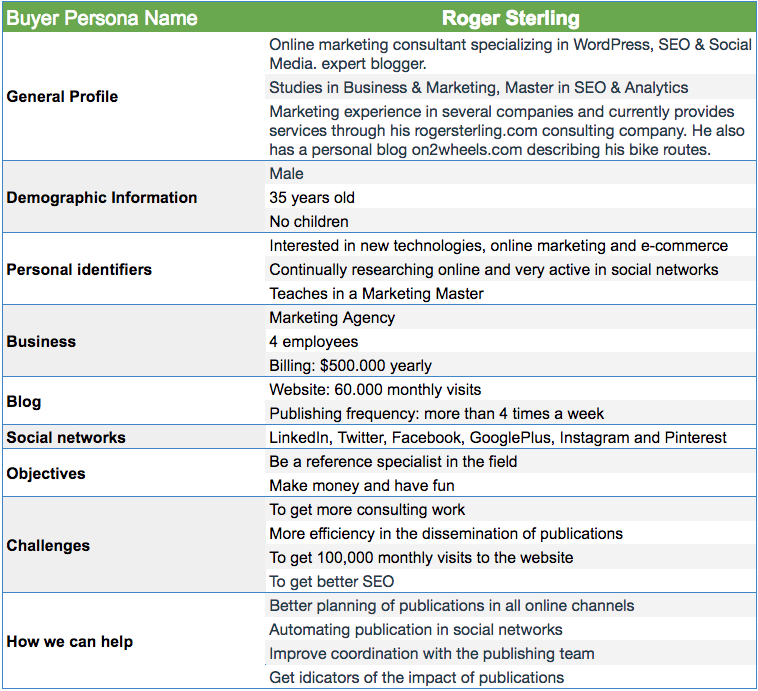 Choosing the social networks where you will publish content is easy to decide if you have previously defined your Buyer Persona. In fact, defining your Buyer Persona is essential to identify which social networks your target audience is looking for information on. As you can see, it doesn’t make any sense for you to publish content on LinkedIn if your target audience is teenagers. Spend some time and care here. Your profile on a social network could be the first impression a potential customer will get of you. So make sure you have the link to your website and the appropriate cover and profile photos for your brand or website on each of them. In your biography, write a clear and concise description of yourself or your business and make sure you include contact information. And of course, answer quickly and correctly to everyone who contacts you through that profile. Also, make sure that your WordPress website is well configured so that the social network correctly understands information from any of your posts. That is to say, you have well configured the Open Graph meta tags. Meta tags are information that is included in web pages but not displayed (which is why they are called meta tags). In particular, if you look at the HTML code of a web page, you will find them in the <head>section of the page, with the format <meta />. These tags are used, for example, to provide Google with a brief description of the content of the page. In this case, Google uses this information to index and better display the content of your website when searching. In the same way, social networks use a series of meta tags (title, image, description…) that are used by the social network to create the “rich graphics object” that is published on the network: the Open Graph meta tags. If you need more details on how to set up these meta tags, I wrote a post about them. 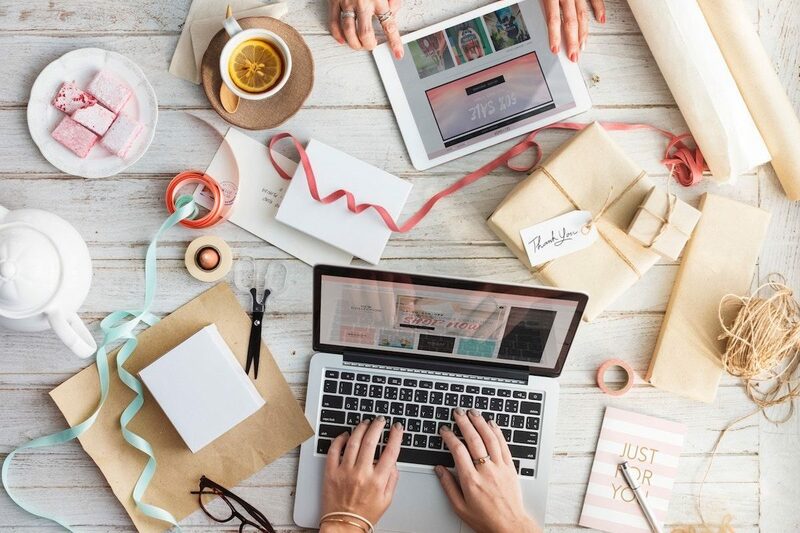 Once you have everything ready, it’s time to get down to business and start creating content on social networks. Keep in mind that we’re all tired of messages that seem to be created automatically by a robot or that don’t give us any value. Does this mean I have to create every message manually on every social network? No, don’t worry, there are tools that can help you in this process. We, for example, use Nelio Content (for obvious reasons 😇). As I mentioned earlier, your followers expect your publications on social media to be interesting and relevant—they don’t want spam. So, if you’ve been able to write a blog post that you’ve worked so hard on, why wouldn’t you want to make sure your messages on the networks are on the same level as your blog post? 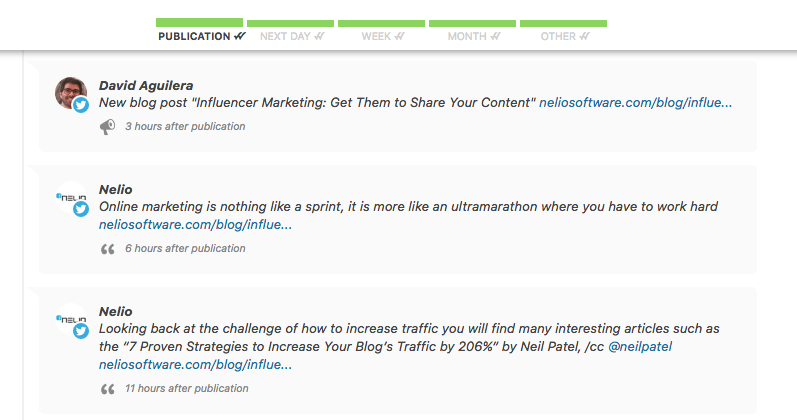 Here are the three types of messages we create to promote our blog. 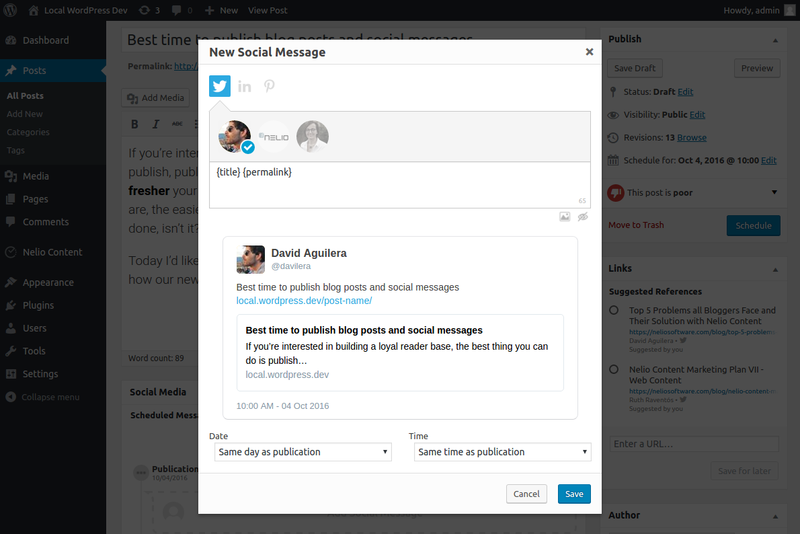 Create a fully customized message for your social profile that describes what your content is most valuable for. With Nelio Content, this task is much easier than it looks. The message can be written from the WordPress editor itself at any point. Just by indicating that you want to add a new social message, a new window opens up. Write the message you want to share, indicate in which social profiles you want it to be published, set the date and time of publication, and you’re done! One option to create social messages automatically without your doing anything is Social Templates. A social template is a predefined text (with some “variable” parts) that our plugin uses to generate specific messages for your posts. 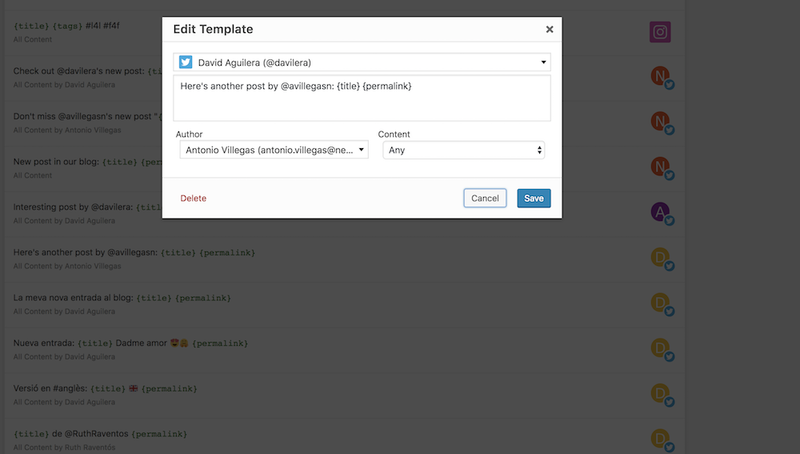 Dialog for editing a social template where you can configure how it works. As you can see, this template only applies to posts that Antonio has written. And with this simple solution, David can automatically promote Toni’s posts. Cool! If you’re interested in using this solution, I recommend you create social message templates exclusively for certain social profiles and make them as personalized as possible. #1. As you type, you can select a phrase and manually create a social message. A window will open in which you can edit and modify the message as you wish and indicate when you want it to be published. #2. Highlight all the phrases you would like to auto-share and then automatically generate all the messages in the different social profiles. #3. 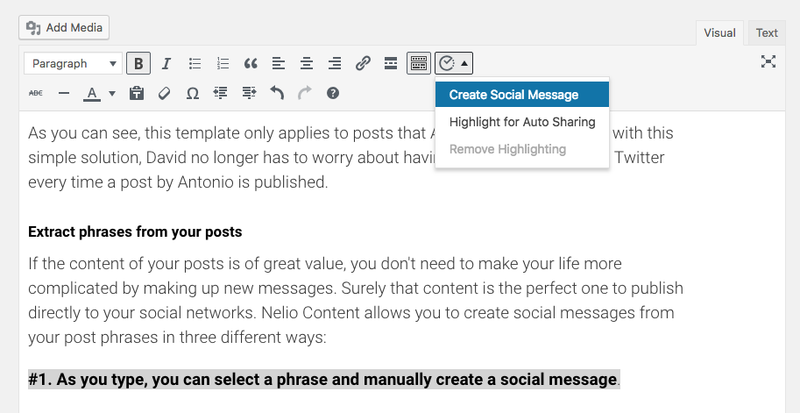 Automatically extract relevant sentences from the text: Nelio Content includes an intelligent algorithm that automatically extracts relevant sentences from your post and creates messages to share on your social networks. 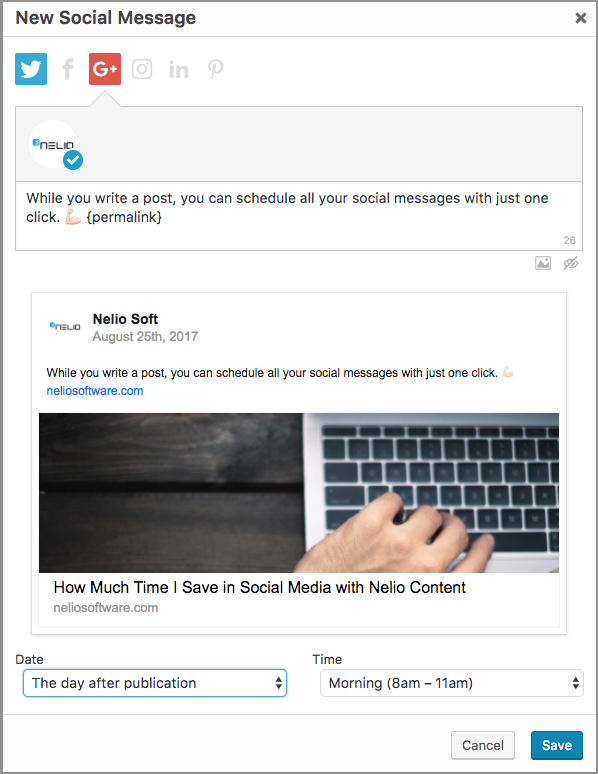 What’s more, Nelio Content, when extracting phrases from your text to create a social message, is also able to make Twitter mentions when the phrases include references to external links. Not only that it is very efficient, but it’s also extremely easy. And the generated content of your messages is definitely interesting enough to attract your target audience! How Many Messages Should You Create? Another question that often arises when we ask ourselves about social media promotion is how many messages we should create and how often they should be published. There is no single consensus on this issue and it depends a lot on the market to which your messages are addressed. But you’ll find more information on this topic in Toni’s article: Optimal Frequency of Publication on Social Networks. As you can see, the content you publish on your blog is the best resource for creating valuable messages on social networks efficiently and automatically. 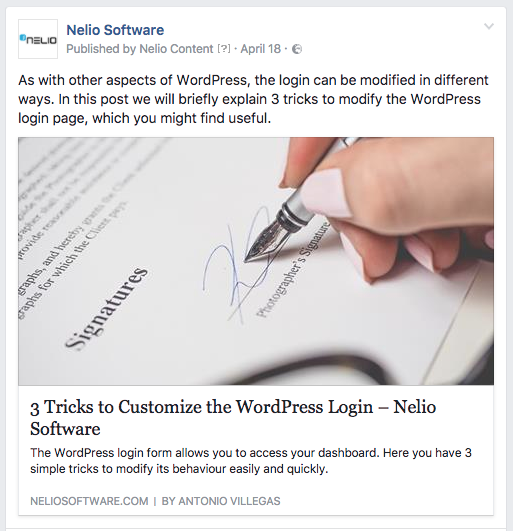 If you use a suitable tool such as Nelio Content, you will save a lot of work in promoting your own content.